The past few days I have been rather frustrated with Linden Lab’s technical support. While I’m sure that I will get the answers I require from them… eventually… after missing half a dozen deadlines and trying to hammer some sense in them… the point is, why should it be so hard to get Linden Lab to do what we need them to do?? Then just yesterday we got a poisoned gift. One one hand, Second Life Viewer 2.0 is officially out of Beta and became the regular viewer with which new residents will have to go through the new Welcome Areas. This is, in general, good. We’ve been stuck with pretty much the same interface for the past… eight years. It’s way too long. I always embrace change, even if I’m quite sure that a lot of people will disagree that the current UI is worse than before. It’s pointless to argue: people get familiar to all kinds of things, good or bad (and the 1.X interface was quite bad), and change to something unfamiliar will always be perceived by some as being “terrible”. I won’t go into that. No, what worried me was the new Terms of Service, and the whole way Linden Lab is handling the Third-Party Viewers. I’m now convinced that they are the product of a severely deranged mind, and promise to cover that in more detail on another post. I’m too furious now to write a rational article about the changes. Suffice to say that LL is very, very lucky to be 12,000 km away from me. For today, I’ll just be happy to point out that LL’s absolute refusal to understand their customers or to even remotely address what they wish has now some serious consequences. I’m not even implying that they have to be nice or considerate; or that they ought to adhere to the motto that “the customer is always right” (because often they aren’t). I would just say that I would expect at least a minimally rational approach to deal with customers. And that “minimum” is merely making sure that they continue to be happy enough with LL’s services to pay for them. I’m always glad to give the ‘Lab a “second chance” to correct their silly mistakes and policies and offer an apology (or, more likely, an excuse…) to make things better; and I definitely understand any sort of excuses that are financially solid, e.g. they might make some customers angry, but the overall benefit to Linden Lab as a profitable company will by far compensate the antagonising of a few customers. No, the problem is that in the past year or so, Linden Lab has increasingly insisted in adopting policies that benefit no one — not even themselves! For instance, getting rid of casinos a few years ago has crushed the in-world economy by a third, and made literally hundreds of thousands of residents leave SL forever. But it made Linden Lab less liable to future lawsuits. So, in a sense, an unpopular policy was, indeed, beneficial to Linden Lab in the long term. LL has done quite a lot of those in the past. They might make residents angry, but the company became either more profitable, or less liable to lawsuits. So these are acceptable policies. The problem in the past year, however, is simply that the policies now make no sense, they hurt all residents, and they hurt Linden Lab directly and indirectly: making them more liable to lawsuits (for breaking civil rights), and forcing more residents to leave SL and stop paying LL, thus making the company less financially solid. Policies that increase LL’s legal liabilities and make them lose money at the same time are completely pointless and impossible to accept! Worse than that: even when internally some employee gets enraged at those policies and speaks out, they get fired. Six (6!) left Linden Lab just the past week. This doesn’t bode well. And it’s reflected outside the SL Blogosphere too. 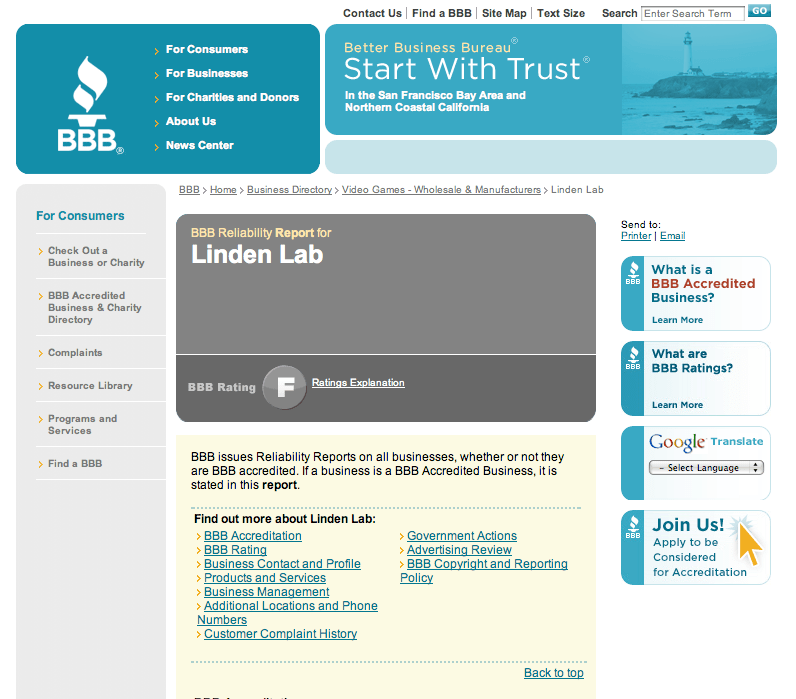 Linden Lab has earned the dreaded “F” rating from the Better Business Bureau. (Look it up if you think it’s an April Fool’s joke! Yes, it was there yesterday, and will remain there tomorrow). My colleagues across the Atlantic were baffled at this. They claim that no company is able to get an “F” rating and still stay in business for long. You can go to the BBB and look up some companies that you consider to have very, very bad customer support; you’ll see that most have low ratings like… D at most. 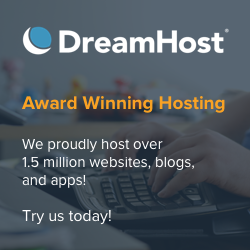 (Microsoft is A+, Apple is B+, even Dreamhost has merely a D; Comcast, which pops up on a Google search for “Worst Company Ever” has a C). Nobody has an F! It’s too shameful! And, worse than that, it faithfully represents the reality of Linden Lab’s consideration towards their customers — which can be pretty much summarised as: “we couldn’t care less about our customers”. Now I know I’m particularly emotional about this. 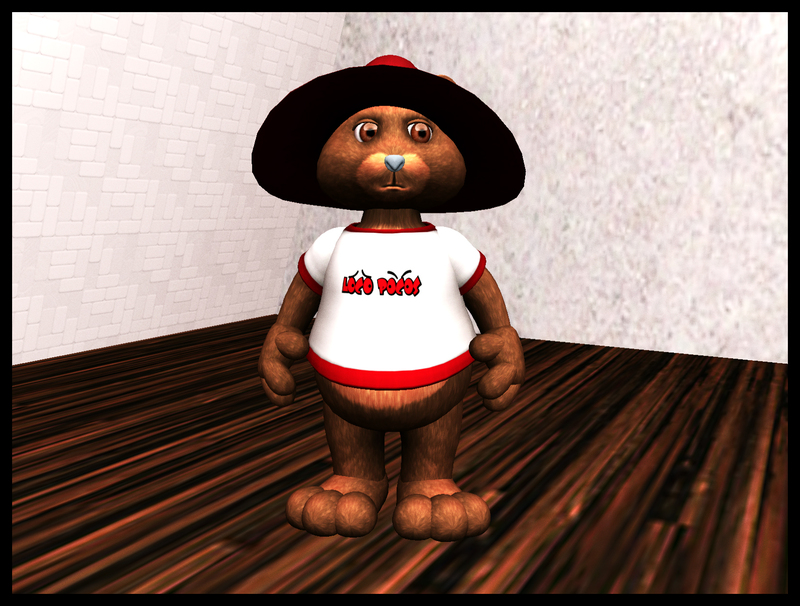 For the past six years I have been promoting Second Life, and, indirectly, SL’s creators, LL. At the very beginning I used to tell everybody how cool LL was, and how close they used to be with the residents. With the years, I always excused their increasing distance — a big company has little time to keep in touch with customers and needs better channels of communication. LL struggled a lot with that around 2006/7. But since 2009, the struggle has stopped. They dropped all pretence of even remotely caring about their customers. They come up with the most hallucinated ideas of what people want to do in Second Life, and implement the strangest policies. They are totally disconnected with the reality of Second Life. They refuse to listen. They decide first, and ask questions later — just to ignore them. They implement policies that the employees know that are a shot in their own foot, but instead of keeping an open mind and admitting that these policies might be adapted in the future, they make it quite clear, from the very beginning, that they will not make further changes to them. It’s like they’re living on another planet, and emitting policies that have little or nothing to do with what this planet needs — because they aren’t even aware of what the issues are! Of course some good things are coming out. Projects at the ‘Lab take often 12-18 months to complete (and that is not a bad thing in itself), so several good ideas are still being rolled out. The Viewer 2.0 is definitely a good idea, even if people are averse to change. SL Viewer 2.1 will bring amazing things that have been demanded for eons. Version 7 of Havok Physics is allegedly being tested on the Preview Grid. The new server software, 1.38, due for next week, will allow land owners to better control how scripts consume memory on their land. In the far future, viewer-side scripting will be enabled (allowing you to change the functionality of the UI itself and embed plugins in it, not unlike what Web browsers do). So it’s not as if there is no progress; a lot of work is being done “under the hood”, some of which might even see the light of the day this year. No, the problem is mostly about the policies. And this affects everything, from the terms of service to the open source development groups that collaborate with LL to make Second Life a better environment. We all suffer from the complete disconnect from reality, and it shows on the BBB’s rating. My challenge to Linden Lab is to prove that I’m wrong. Show me that you care about your customers. But don’t use nice words embellished in corporate speak: turn that F rating into a D in 6 months, and into at least a B by the end of the year. If you’re willing to do that, you’re showing good will and that you finally woke up to the realisation that you have no clue about what we residents want, but are willing to change your attitude and at least make an effort to be back in touch with reality.